Despite the rings, the happy couple pictured above are not married – they’re just friends. More on this later. She held out a tiny mouse. As in, really, really tiny. Eyes closed. “We have to take care of him,” she said firmly. Standing behind her were two fellow high school seniors. One held up a bag containing four bottles of Pediasure. “We looked it up on the internet,” said one. I dragged out the heating pad, some Kleenex, and a 1 cc syringe. We diluted the Pediasure, warmed it, and fed him drop by drop. 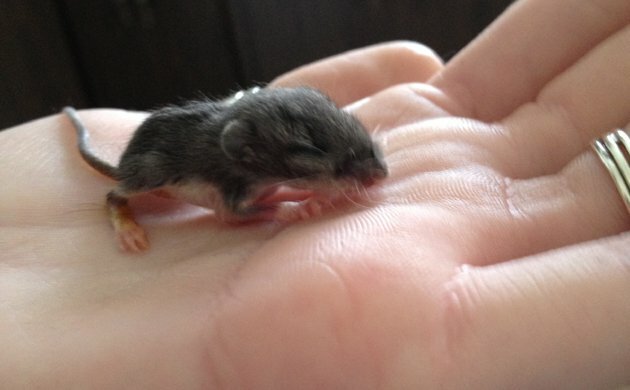 I called my wildlife rehabilitator friend Maggie Ciarcia, who, yes, has rehabbed baby wild mice before. She said you need to feed them Esbilac, not Pediasure, and you can feed them every three hours. This one seemed awfully hungry, so we started him on a two-hour schedule. He quickly learned to grasp the syringe with his paws. “Don’t you take care of hawks?” asked one of Skye’s friends. Suddenly, they all looked alarmed. The irony was not lost on me, especially when I reached into the freezer that night to take out a dozen frozen adult mice, all of which would defrost by morning. 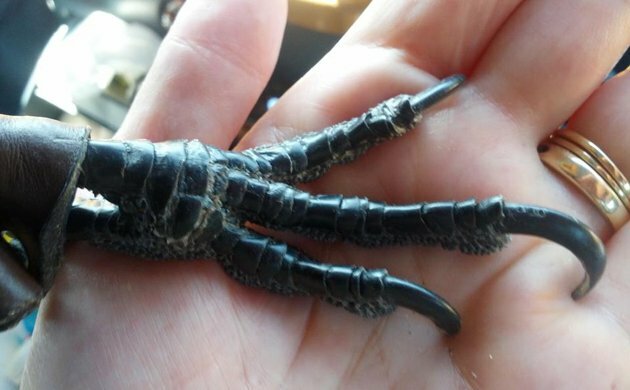 Once a week I hike into the woods and leave them for the multi-generational family of Common Crows I’ve raised and released over the years. The crows are wild, live on their own and won’t let me too near them, but I keep in touch with them for old times’ sake. And because it’s such a kick to whistle and have wild crows fly toward you from all directions. Ask my rehabber friend Jodi Swenson of Cape Ann Wildlife, Inc., pictured above. I whistled, but the crows didn’t show up. They have large territories, and are sometimes out of range. Normally I hide the bag by the side of the trail, go on my hike, and try again when I return. This time, however, I returned and the bag was gone. This had never happened before. I frowned, envisioning headlines in the local paper about satanic woodland mouse rituals. I glanced ahead of me and right in the middle of the trail was the bag, with perfect crow-sized beak holes in three different places. Apparently they had found the bag, helped themselves, then made sure I was aware there was garbage to remove. Sounds like you are teaching your daughter well. I liked your story about the crows, too. Suzie, you really are the coolest !!!!! These comments crack me up. Eileen, our brains are just wired in a bizarre way, that’s all I can figure out. LOL Mary, it is fun/confusing! Thanks, Wendy – never dull around here. Meredith, “repurposing it?” That really made me laugh, I have to remember that one! The Duck Stamp and The Wildlife Conservation Stamp Living in Symbiosis?